This December 2017 Cantwell’s Tavern Review is based on my own personal experience eating there with my family. 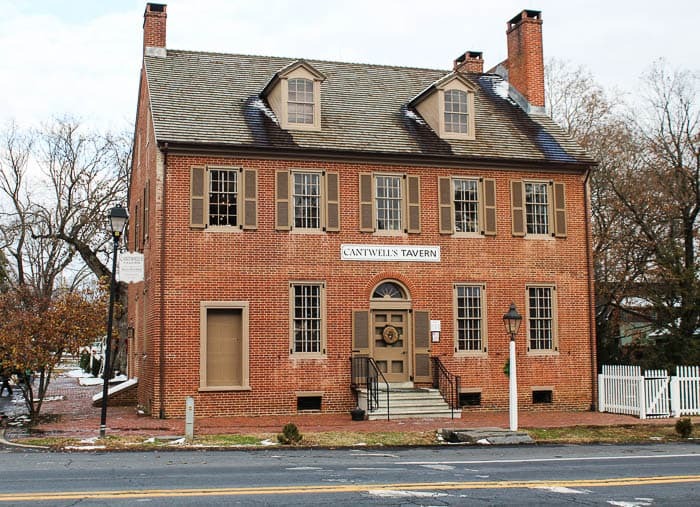 Cantwell’s Tavern is located in the historic district of Odessa, Delaware. The building, built in 1822, was originally called the Cantwell’s Bridge Hotel and Tavern and operated as such for 100 years. When you walk into Cantwell’s Tavern, you feel as if you are walking back in time! We visited during a very cold night, but with 2 fireplaces burning in the room we were in, we were plenty toasty! Cantwell’s is a casual restaurant that serves unique, upscale food made with locally sourced ingredients. The menu changes depending on the season and what ingredients are available locally. Being a tavern, Cantwell’s drink menu is huge. I ordered a seasonal special called The Big Apple that tasted like fresh apple cider! It’s made with apple cinnamon infused whiskey, apple cider reduction, fresh lemon, and sweet vermouth. 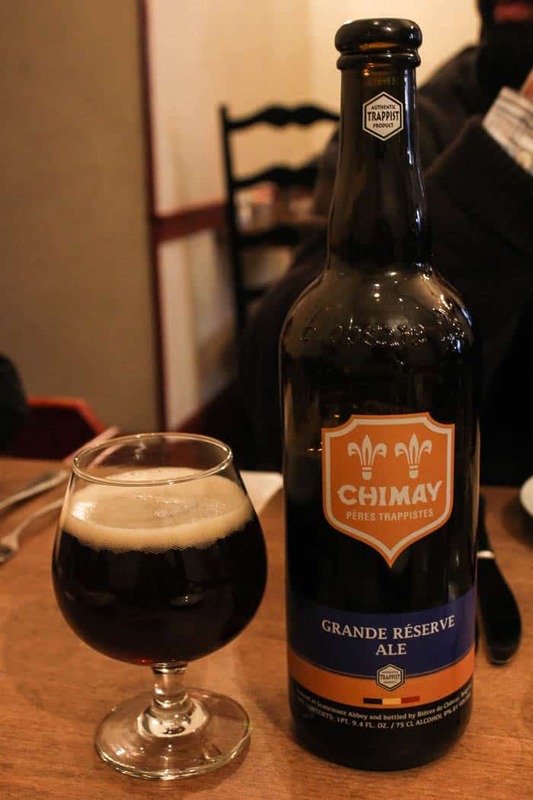 My fiancé had a difficult time choosing, but ended up with the Chimay Grand Reserve. Usually the appetizer menu isn’t very appealing to my children, but peanut butter and jelly sure is! As soon as I saw this on the menu, I knew we had to order it for them. 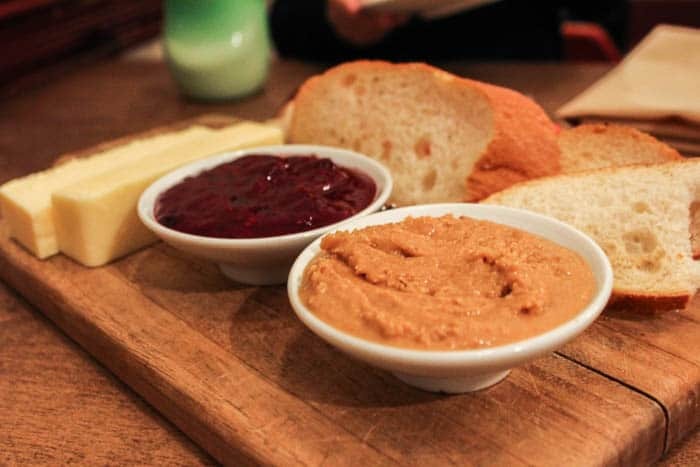 Both the peanut butter and jam are made in-house. The jam was so good that I had to ask what was in it. The server told us that it was made with blueberries, raspberries, and strawberries and that they make it differently depending on which berries they have available. This board also came with aged cheddar cheese and bread. 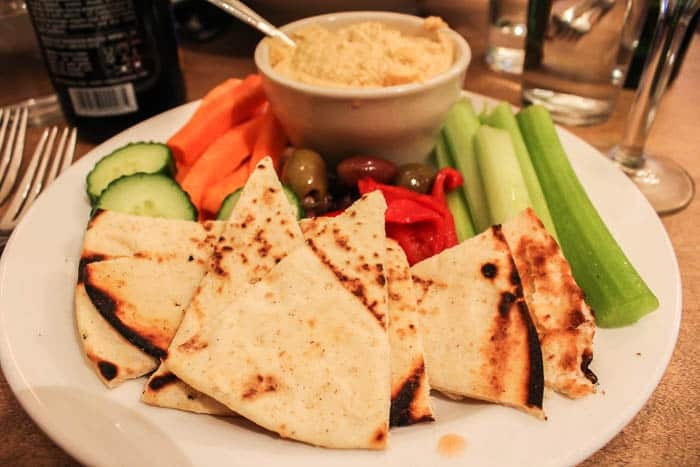 I love hummus and will almost always order it if it’s on the menu! This came served with carrot sticks, celery, roasted red peppers, cucumber, and olives. It was delicious. As soon as my fiancé saw this, that was it. He had to have it. I didn’t think I was in the mood for tuna, until I stole a bite! These were amazing! 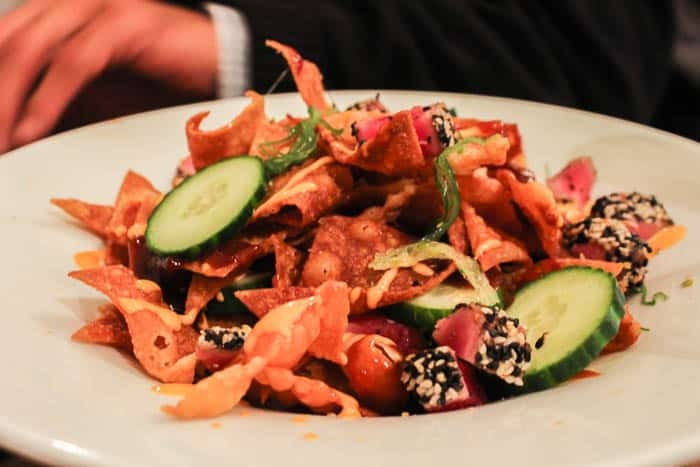 The chips are fried wontons and it’s served with a sweet soy sauce and seaweed salad. My 10-year-old no longer orders off the children’s menu. He ordered the “Big Mac” burger from the regular menu, but asked for it without onions. The server informed him that the Mac Sauce is made with onions, so he refused that as well. He said the burger was really good. The french fries that came with the meal were also delicious! They are freshly cut and fried. You can really tell the difference! I ordered the Pan Seared Scallops. It was not an easy decision, as everything on the menu sounded amazing. This entree comes served with a butternut squash puree, pepita brittle, golden raisins, charred cauliflower, and a maple-pecan gastrique. 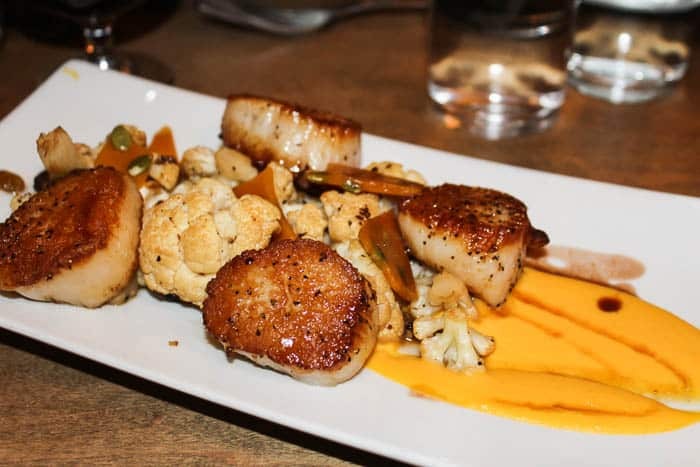 The scallops were cooked perfectly and I loved the sweet flavors that all of the other components added to the dish. The pepita brittle is just like peanut brittle candy! I wasn’t quite sure how to eat it with the rest of the dish, but it was delicious on it’s own anyway! My fiancé eats a lot. I mean, a lot. So when we eat out at nicer restaurants, he always has a difficult time deciding what to order because it’s rarely enough for him. He ordered the Twin Crab Cakes, hoping that it would be a bigger meal. It comes with cauliflower puree, arugula, mustard seed jam, pickled red onion, and house bacon lardons. It wasn’t really a huge meal like he had hoped, but he said that the crab cakes were really good! 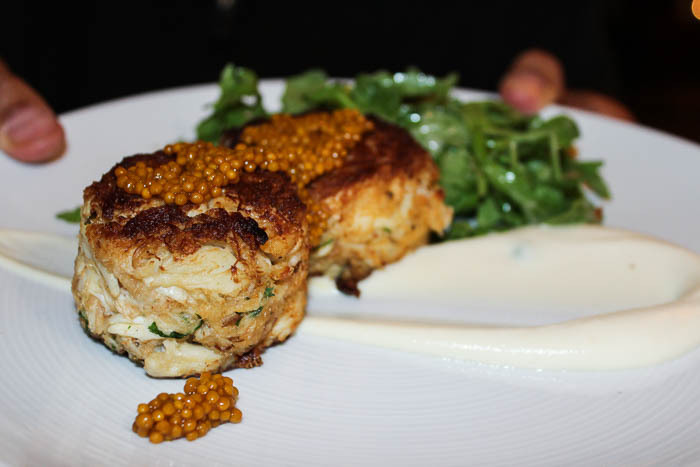 He mentioned that often there doesn’t seem to be much actual crab in crab cakes, but that these were loaded! He also really enjoyed the arugula salad. There is no photo of this because I got a little too excited that I was actually getting to eat dessert! This dessert included 4 big chocolate chip cookies, served with a glass of malted milk, a scoop of vanilla ice cream, and whipped cream. While the chocolate chip cookies were absolutely delicious, I was surprised how much I loved the ice cream and whipped cream. Usually my fiancé and son are the ones who order ice cream for dessert, but Cantwell’s was the best I’ve ever had! So good! Whether you’re a Delaware resident, or just passing though, Cantwell’s Tavern is definitely worth a visit! While you’re there, be sure to walk around and check out the historic town of Odessa, as well! 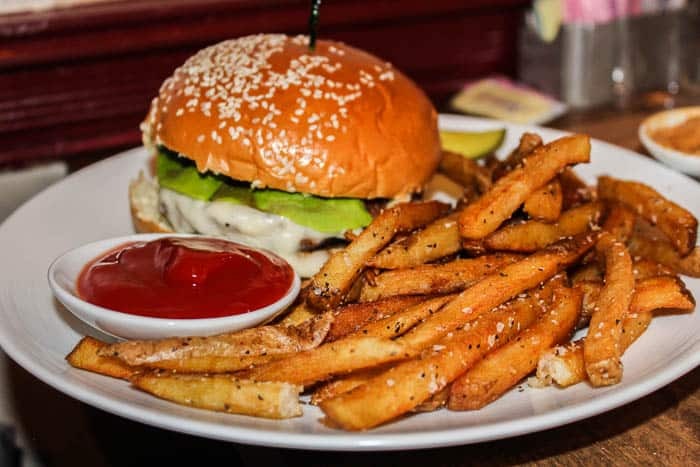 For Cantwell’s Tavern current menu and pricing, click here!